Alist Meals was established in 2016. Our goal is to provide cost efficient, convenience, and healthy nutrition to our community. Preparing meals is time consuming and can be expensive. We have developed Alist meals to help individuals optimize their time, money, and nutrition! 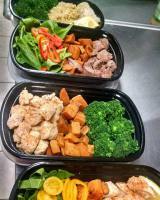 Our meals are prepared by athletes who know and understand nutrition! Kathleen is a Master Fitness trainer and LPN in the U.S. Army Reserves.